1. use a signature gift wrap. if you're like my mother, you go crazy post-christmas buying discounted reindeer print wrapping paper. then you forget you own it, and buy snowflake print wrapping paper on black friday the next year. it's a vicious cycle that leaves your home overrun with unused wrapping paper, and in a print that can only be trotted out once a year. i use the same paper and ribbon all year round. yep. it's my signature. it's glossy dark chocolate colored paper from the container store, and i tie it off with gold shimmery ribbon. the color scheme is very me and it fits with most any occasion you're giving a gift for. i tuck 1 roll of each away in a corner, so it's always on hand but at the same time it's never overcrowding my closet. 2. create a gift area. if you shop year round (which is my strategy), you need a designated gift area. a corner in the closet. a box under the bed. you can't just have little collections all over the place, you'll forget what you bought. if you have a signature wrapping paper, hint hint, you can also pre-wrap and label all the gifts, saving you time come christmas (just don't forget the label part). this means also keeping a list with the area, and upload it to your phone if you need to. if you find a great deal in january on a gift for aunt kathy, you're going to forget what you bought come december, guaranteed. there's also some great apps available to help you keep a list all year round! 3. get the old stuff out now. pre-christmas is the perfect time for you or your kids to get rid of stuff. if you're just at the brink of organized now, but it's a precarious balance... what happens to the influx of new things? i get clothes for christmas from my mom (she has great taste) so in anticipation of that, i weed out my closet of those too well-worn sweaters and old socks. (bad at this? watch 'what not to wear' on netflix while you do it.) i also try to donate the nice outfits and purses i don't use any more, in the hope that they'll find nice homes for christmas, with someone who can appreciate them. if its your kids that have too much, tell them that santa can't leave any news toys unless they leave him a bag of their old toys for him to take back to the north pole for other kids. it works, and then you're not the bad guy for donating things they don't play with anyway. and no more december 26th 'where do we store another f*$%!! barbie doll?!' moments. hawkeye doesn't understand this logic, so she just gets mad at me. oh well. what about you? 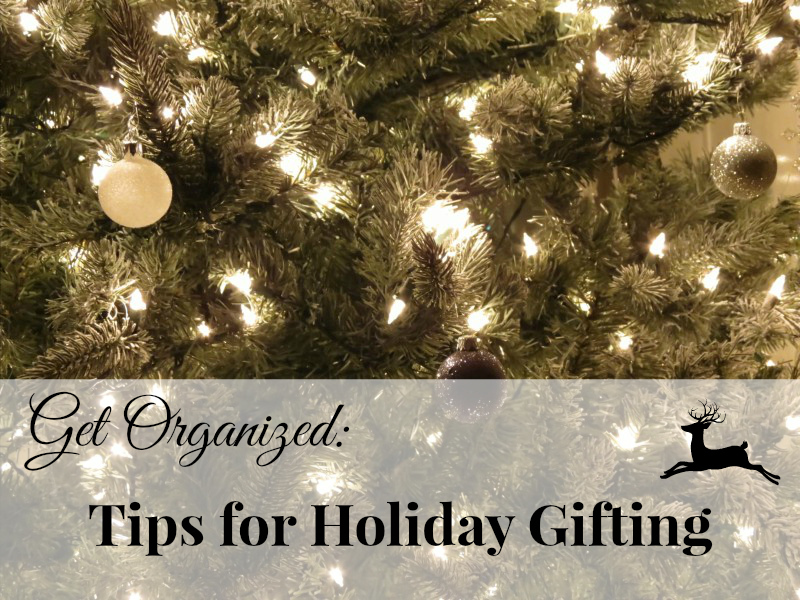 what do you do to get organized in your gift giving and receiving? I do all of these. My signature paper changes every year. This year I've chosen a black and white damask with red ribbons. I even have plans to make my own black glitter labels. 1. I absolutely love our signature paper idea. I'm thinking brown craft paper. Then I can mix and match any kind of bow. 2. I am already planning my organization process for next year's gift buying. I got married this year so I think I get a pass for being so disorganized with gifts (there are 2x as many to buy!). I use kraft paper year round. If I have extra time, I can always decorate it to reflect more specifically the event I'm attending, but it's pretty on its own with some ribbon. Saves a lot of time and looks put together - which are two essentials! STEPHANIE!!!! omg when i opened my feedly this morning and went to my Boners folder and saw that image, i thought: "wait, what? what is that doing there? did i post something about fitness that i forgot about? who....what...how..............STEPHANIE!!!" for real, that conversation did happen in my head. LOL no worries, i was just surprised that you picked that image. i thought for sure you'd pick something like my asian posts. i love this and thanks so much for the props. you have definitely popped my sponsorship cherry and made this whole thing an awesome experience. now, the organizing. girlfran: I NEED YOU IN MY LIFE TO ORGANIZE IT. every day i walk into my closet and say to myself: chin, you need to get it together. you are 38yrs old and still can't get your closet organized? WHAT THE HELL IS WRONG WITH YOU?! but here's my problem - i don't know where to start and if i do, i run out of steam and then it's the ol' "eh, i'll leave this for now and get back to it later" and by later, i mean never. HELP ME. Love your suggestion of one paper, but I think I would get bored. I am more like your mom with an overflowing selection of paper. I only use one paper per Christmas though. lol I also get all my shopping done by December 1, so I can avoid the craziness that happens after that! I'm all about the signature wrapping paper! I usually buy one roll of wrapping paper that I really love and use that for everything over the holidays. This year I bought a cheap roll of brown paper and have been wrapping with that then adding some sort of charm or decoration to the outside of the package. screw her and those abs!! I too like to be very organized with gift wrapping, it drives the manfriend nuts but I spend days trying to decide which paper to go with! great tips.. I really need to listen to #3. only if I wasn't so lazy. I love the idea of a signature wrap. I bag everything though because my wrapping looks like it was done by the blind. When I bring the Christmas decorations in from the shed, I keep two of the tupperware bins inside and store them in our utility closet. All purchased gifts go in there until they're ready to be wrapped. I NEED and keep meaning to clean out my daughters to young or not played with toys. I am so behind this year, it's really driving me nuts and I vow to do better next year! I love the signature wrap idea. I have a flat tupperware wrapping drawer and it is filled with event specific paper and is a nightmare. I totally envy your organization skills!! Great idea about telling the kids that Santa wont bring them any new toys if they don't leave some old ones! I wonder, do this work on boyfriends too? And I agree on Kathy...both her and her blog are ahhh-mazing! Getting rid of stuff is the best feeling, especially before the holidays. You get to start the new year fresh! I'm guilty of buying a million different kinds of wrapping paper. I can't help myself. I see it. I want it. I buy it. I need help!!!! I do have a designated gift area though... so that makes up for it, right? Thanks!! Glad you liked them! You know how all over #2 I am! I've been better about wrapping them earlier this year too. I think my goal for next year is to have everyone's gifts ready to go by December 1. Would be nice to have to worry about that. if only I could take these tips & actually do it!!! I am so unorganized with the holidays & I feel like with life in general!!! You just sold me on the signature wrapping...why have I never though of that. I'm off to invent my own signature wrapping scheme! I always buy one tube of wrapping paper before Christmas and then a bunch after when it goes on sale. Wow she is pumped. My friend Angela went from a size 14 to a 4 in about 18 months and now she is full on training to do figure competitions she is getting PUMPED too big time. Holy cow!! Your friend sounds intense, that's so awesome for her!! I could never be that dedicated. Your gift wrap sounds gorgeous!!! I like the idea of having a signature wrap! Ohhh signature gift wrap! That is fancy of you. Speaking of, have you chosen a signature cocktail yet? EVER? I have the craziest of christmas spreadsheets. My family mocks me, but guess who rarely goes over budget?!? ME.